Please do enjoy and be inspired to give your best for the expansion of the Lord’s kingdom on earth. You can click on the link to get to the website live (Sorry some of them may be broken). Which one of these websites inspired you? What do you have to say about them. Share in the comments section below right now. 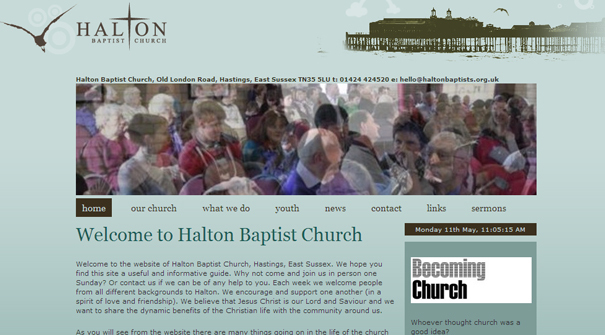 121 Community Church Website Design: A bit traditional but see that video up there? Cool? Aloma Church Website Design: Creative navigation and graphics. Bold, daring background. 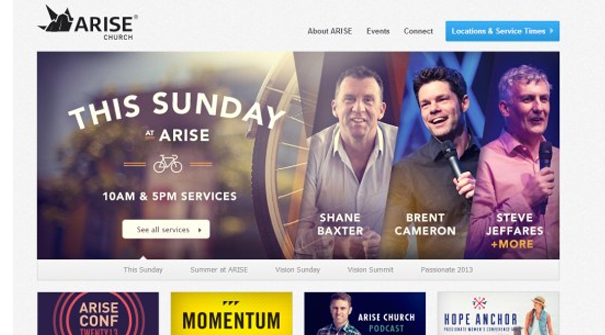 Arise Church Website Design: Beautiful graphics, simplified navigation emphasis. 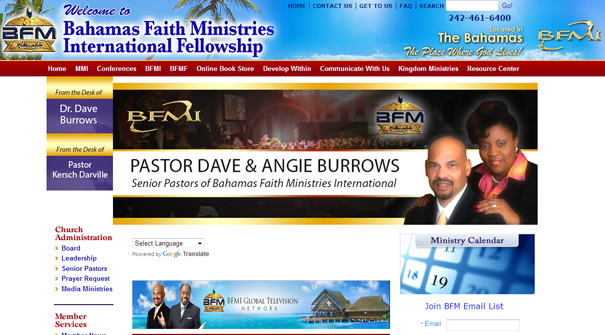 Bahamas Faith Int’l Ministries Website Design: How can we improve this website? 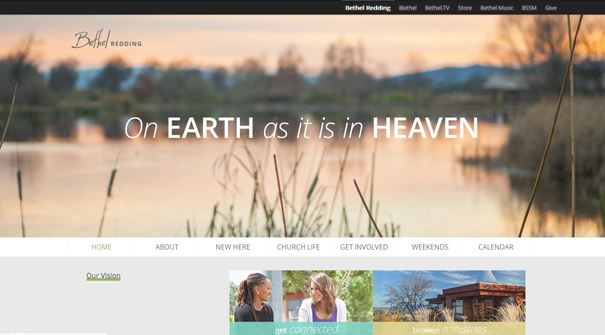 Bethel Redding Church Website Design: Big, bold use of photography; dual navigation system. 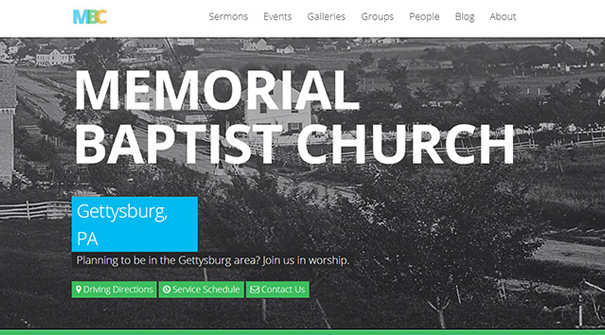 Bethlehem Baptist Website Design: Soothing, nature-like design with image slider. Bible Church Website Design: When you see a black and white website, how do you feel? For me it inspires quite a lot. Sorry link was not clarified so we didn’t include it. 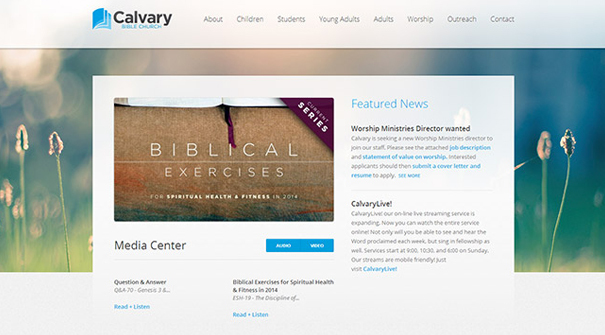 Calvary Bible Church Website Design: Simple, traditional design with additional navigation for simplicity. Calvary Church Website Design: Subtle grey header section with nicely arranged elements with emphasis on service times. Keeps you on schedule for the next church service, GREAT! 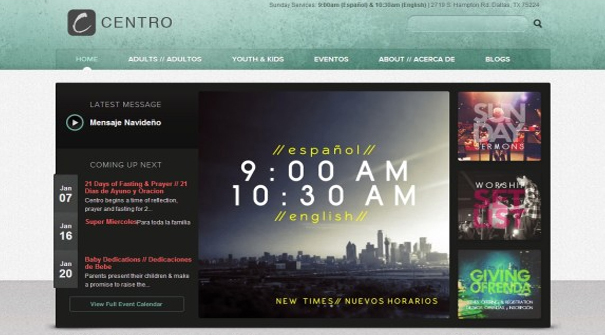 Centro Cristiano Church Website Design: Schedule concept. With this design, you have to just put something in your reminder. 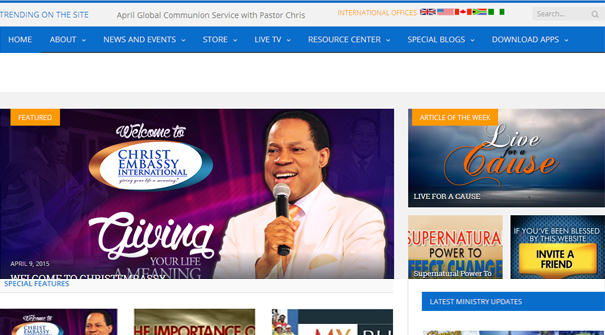 Christ Embassy Church Website Design: If you’ve got it, flaunt it. The design intends to tell everybody everything. Christ Fellowship Church Website Design: Not too comfortable with use of these chunky typography and the leading could’ve been better abi? Christian Center Website Design: Business-like design with welcome design. Imagine your General Overseer welcoming you to church…feeling kinna honoured uhhh! 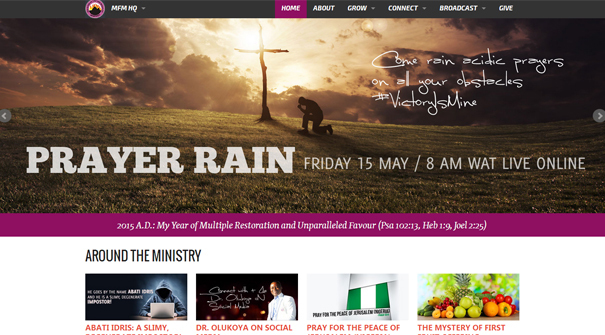 Church of His Presence Website Design: Quite a lot for the eyes to contend with in this design abi? Well that’s to say there are quite a lot that can be improved upon. Cindy Cruse Ratcliff Gospel Website Design: Beautiful bold and high resolution image used here. This concept projects the brand of the gospel artist. A video clip is also up for view. City Beautiful Church Website Design: Creative placement of navigation system to give room for the full width image used. Unique layout with cool color rendering. 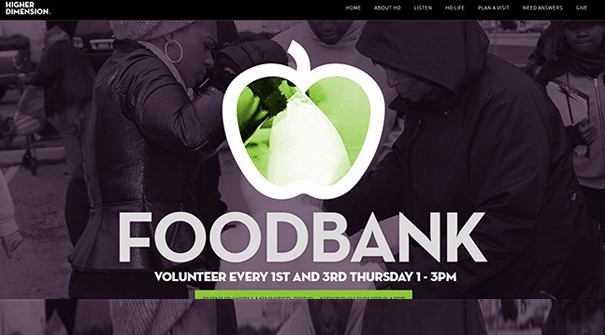 City Church Chicago Website Design: I specifically like the placement of the logo breaking the navigation to show, in one section, stuffs about the church and in the other, church and charity activities. The creative graphic design used here is quite interesting. 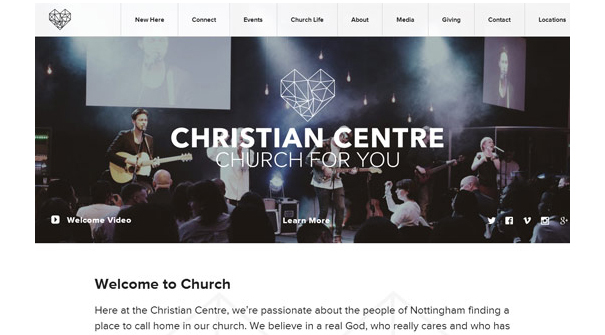 City Church Website Design: Cool, calm, collected and classy design. This is what I call a classic. The web design is so calming with the bold use of a single image. 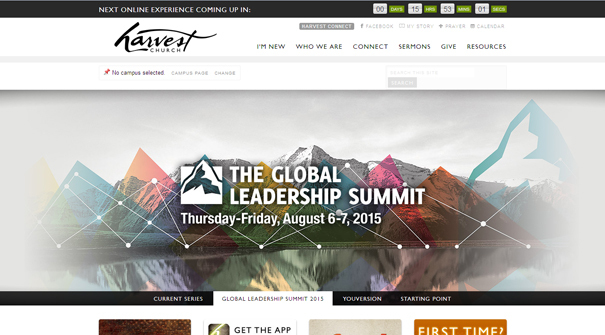 City Harvest Church Website Design: There is clarity with the navigation system of this design. No ambiguity. I like the cross-hatched black background. City of Life Church Website Design: Church and sports? Come on what’s the relationship? A lot! Just wear your favorite team jersey to church and find out. 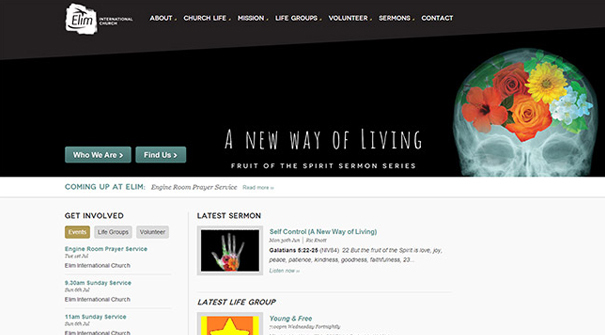 College Park Church Website Design: Dual navigation system yet kept simple. I feel the navigation system below the church’s logo would’ve been better without the white space between the grey boxes. 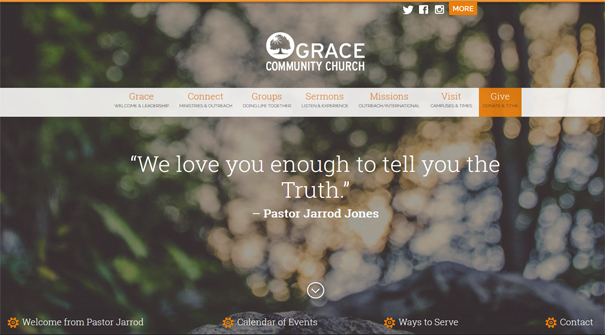 Core Community Church Website Design: Traditional with great photography effects. 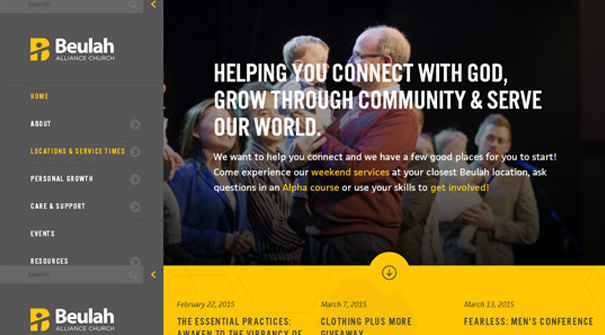 Cornerstone Community Church Website Design: Simplistic design but contrast is an issue here. Cornerstone Fellowship Website Design: Wide-format image usage drawing on new visitors to take a tour of the fellowship. 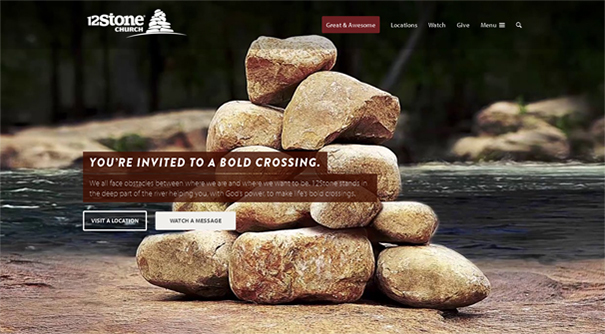 Crosspointe Church Website Design: Beautifully centered design with creative image sliders. This design gives room for relief. Crossroad Church Website Design: Interesting navigation system. I like how the orange arrow around the logo forces the direction of the eye on the navigation area. Creative use of photography. 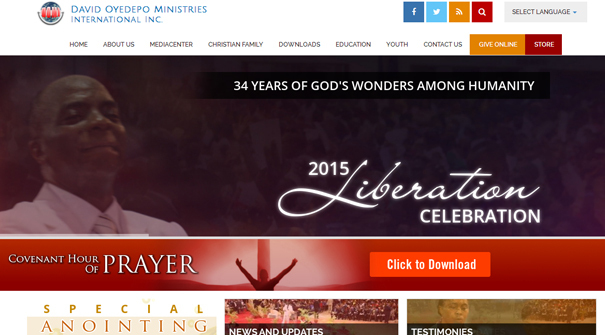 David Oyedepo Ministries Int’l Inc. Website Design: Compelling graphics used here. Header section including navigation area can be improved. 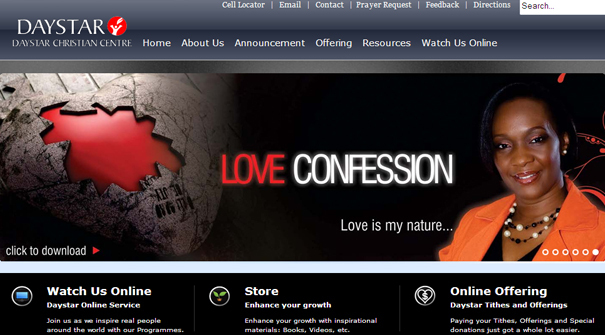 Daystar Christian Centre Website Design: I love the graphics in the banner area. Navigation system can be improved upon. 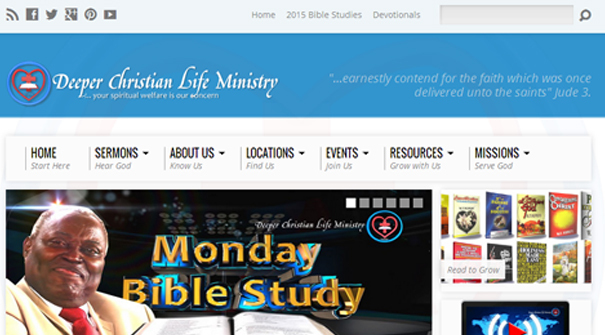 Deeper Christian Life Ministry Website Design: Quite a lot of information here. The eye has a lot to contend with. This can be simplified while putting all the important factors to consideration. 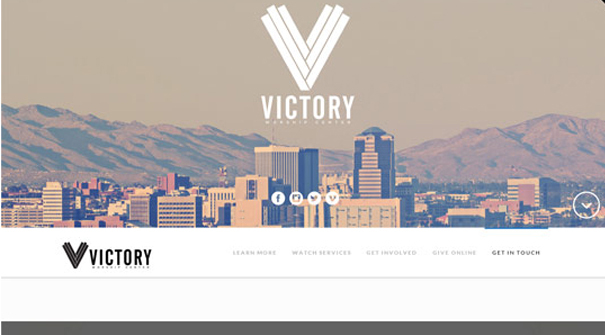 Discovery Church Arizona Website Design: Great conservative design. Logo breaks navigation system nicely. Discovery Church Website Design: Photography is powerful in today’s web design: How would you feel worshiping in this tabernacle? The design takes you into the live experience of worship. 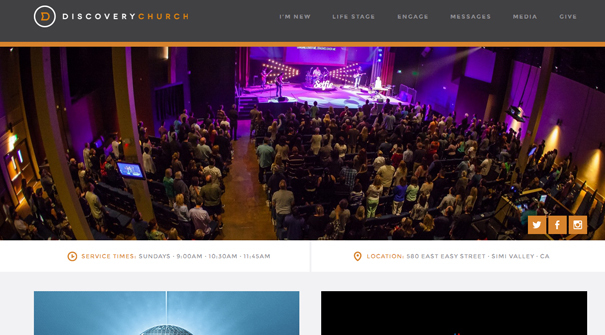 Elevation Church Website Design: Nicely positioned toggled menu makes design look very clean and uncluttered. Concept projects elevation as you life those hands in worship. Elim International Church Website Design: Dry bones shall rise again: concept projects beauty for ashes. There is something beautiful about that thing even if you think it’s dead. Great concept. Engage Church Website Design: Flat UI design with a sidebar that tilts towards engaging you in holy social activities. Epicentre Church Website Design: Conventional, traditional web design. 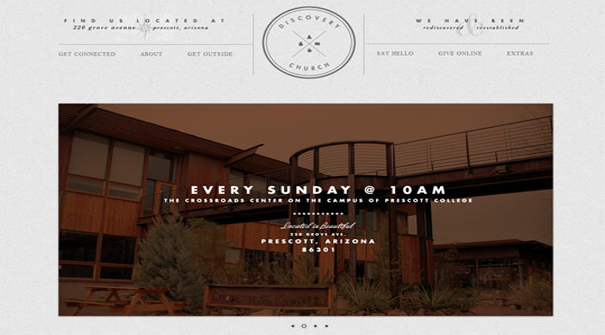 Evfree Church Arizona Website Design: Big, BOLD photography with simplistic menus. 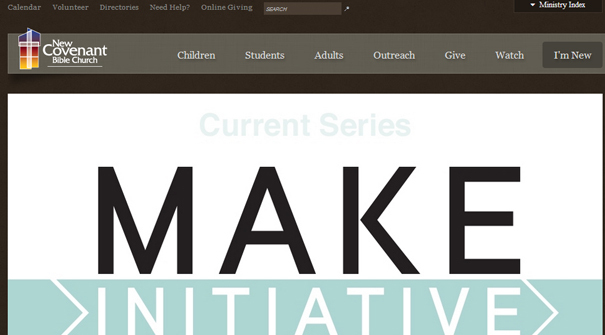 Fellowship Dallas Church Website Design: Great graphics spices up design. First Baptist Church, Dallas, Web Design: The concept projects the “warmer welcome” with emphasis on typography and great photography. Fuel Church Website Design: Great concept but I can’t seem to find the navigation. Gateway Church Website Design: Smiling faces, hands up in worship, rejoicing everywhere…they’re all about people. Glad Tidings Church Website Design: You are filled with smiles because it’s glad tidings. Banner concept tells you that you’ll find what you’re looking for if you come. Guardian Lutheran Church Web Design: You can tell the nature of the church with the photograph used. Vertical drop down navigation menu at the left with another at the right. Harvest Church Website Design: Redeeming the time because the days are evil: This concept give you schedule for the next online experience so we have an online church that also offers leadership training. Higher Dimension Church Web Design: Enough air space to project the single image design and encourage people to give to a good course. The image animation is very unique, rare and uncommon (had to use all the grammar I have, no vex). 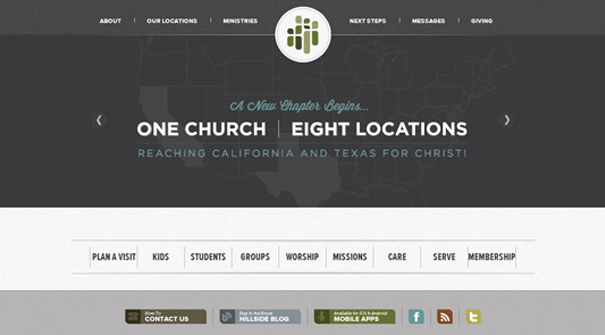 Hillside Church Website Design: Concept pushes the more than one location of the church in and around California and Texas in the United States of America. So what excuse do people who live in the environs have of not going to church. 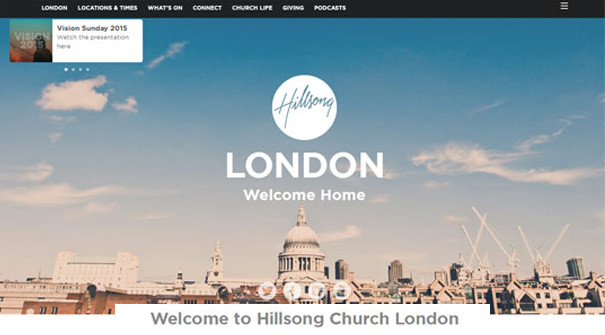 Hillsong Church, London Web Design: Flat UI design that allows a full sized image to breath. Nicely placed toggled navigation at the far top right. 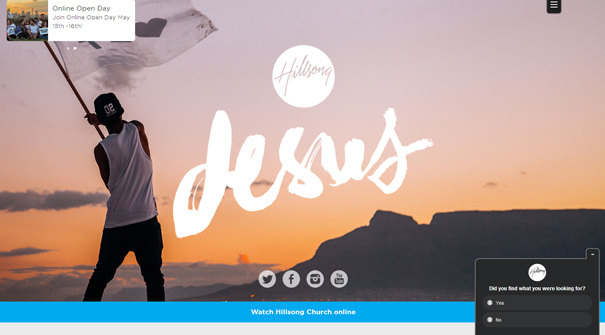 Hillsong Church Web Design: Flat UI design that allows a full sized image to breath. Nicely placed toggled navigation at the far top right and centered social media icons. An interactive chat pops once site finishes loading. 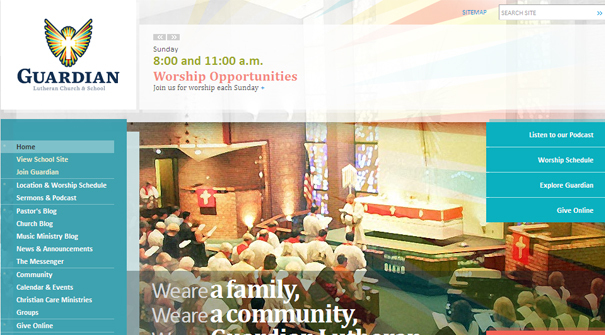 Hope Lutheran Church Web Design: Good site. Graphics can be improved upon. 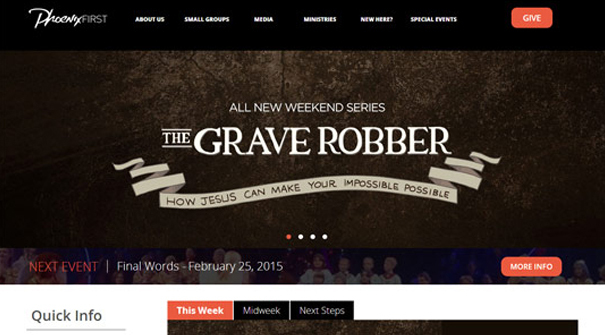 House On The Rock Church Web Design: Great branded web design. I’m a witness, this was a complete branding project. International Church Las Vegas Web Design: Conventional, traditional website design. Joyous Celebration Website Design: Powerful, bold, daring use of photography to project the live experience with South Africa’s greatest gospel group. Kenneth Hagin Ministry Web Design: Banner section showcasing the ministry’s recent product. Side bar design seeks donations as partners of the ministry. Friendly design though a lot for the eyes to contend with. Kingdom Life Fellowship Web Design: Simplistic design and beautiful use of typography to emphasize message clearly. 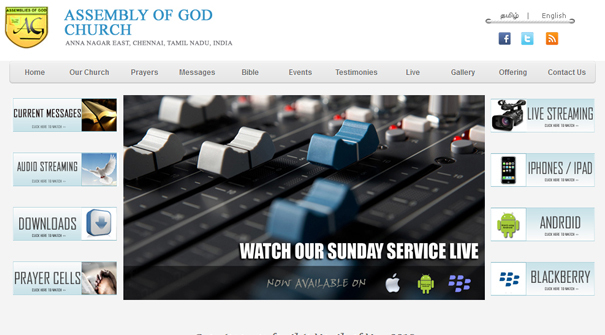 Kwoc Church Web Design: Conventional, traditional design. Typography used in the banner section can be improved upon especially when it comes to contrast and legibility. Lake Hills Church Web Design: Conventional, traditional design with strategic geographic locators in the copy section. Lake Mount Church Web Design: Banner design concept shows the connection, in literal sense, in the presence of Jesus Christ when you worship with the church. Lakewood Church Website Design: Concept immediately projects the pastor and his wife in an wholesome smile asking you to join them in their services. Design shows navigation menu on the left and displays live Tweets inviting you to church. 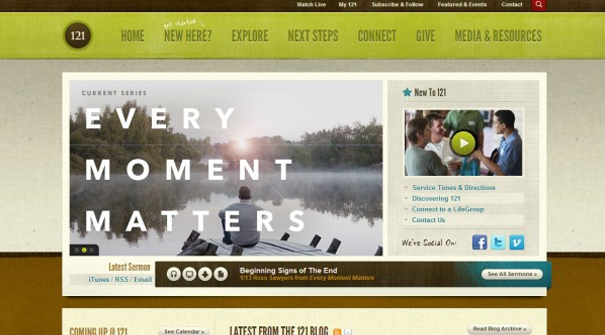 Life Center Church Web Design: Another big, bold use of photography. Design is uncluttered and gives the eye some very great soothing relief. 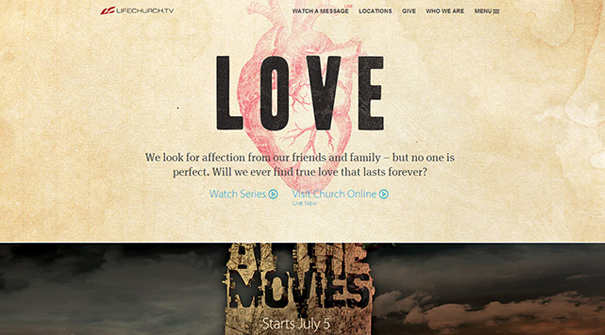 Life Church Website Design: Heart of love concept. Design capitalizes on space to focus on main concept projected in the banner area. 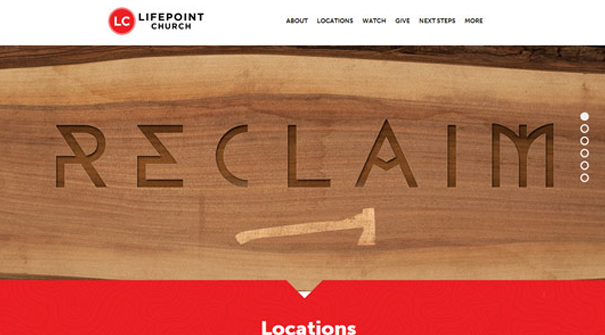 Lifepoint Church Web Design: At Lifepoint church, you RECLAIM all you have lost. Great simple, uncluttered design with a uniquely positioned image slide indicator. Ligonier Church Web Design: One of the image slides show the church’s series now an app available for members (and interested subscribers too) to download. Living Hope Church Web Design: Above and Beyond what? You have to click to find out. Great concept that leads the user to satisfy his or her curiosity by taking an action. 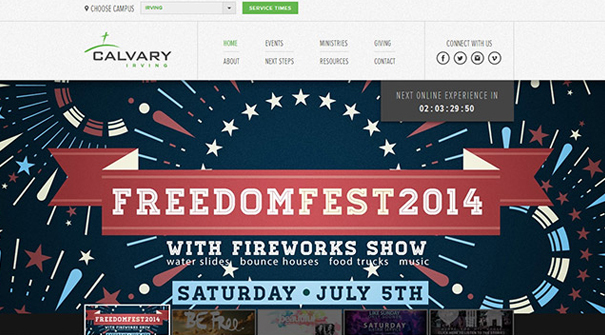 Long Hollow Church Web Design: Conventional, traditional design. Mansfield Church Web Design: Interesting concept that emphasizes the importance of the action you take after you’re saved. 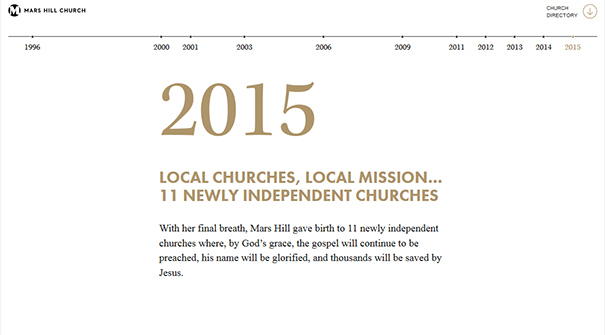 Mars Hill Church Website Design: Award winning design gives a historical tale of growth and expansion since church’s inception. Powerful user interface and indeed a very uncommon concept. Mountain of Fire and Miracles Ministry Web Design: Beautiful, bold and high-resolutioned (permit my grammar) graphically designed banner section. Strategic use of brand colors; chunky and light fonts used to contrast; cool and calm. Great work for a Nigerian church website. Mount Ararat Church Web Design: I can see a mountainous edifice: Concept draws attention to the place of worship inviting you to just visit. New Covenant Bible Church Web Design: Conventional, traditional design wanting you to make that initiative. 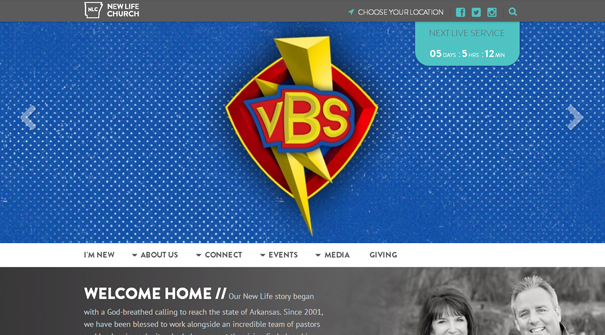 New Life Church Web Design: I like the unexpected positioning of the navigation menu. Newspring Church Website Design: Flat, clean UI design with a sliding search form. 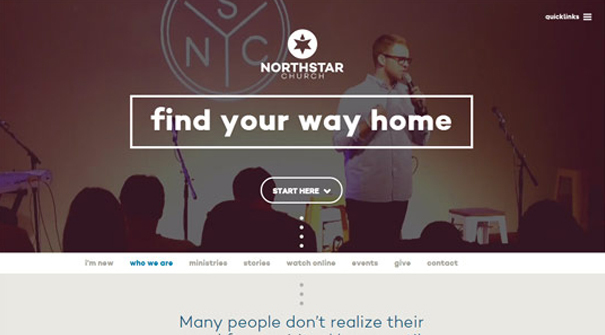 Northstar Church Web Design: Design gives a clear direction where to start with navigating the website. Direction is powerful as a lot of us usually find it daunting to start from somewhere. 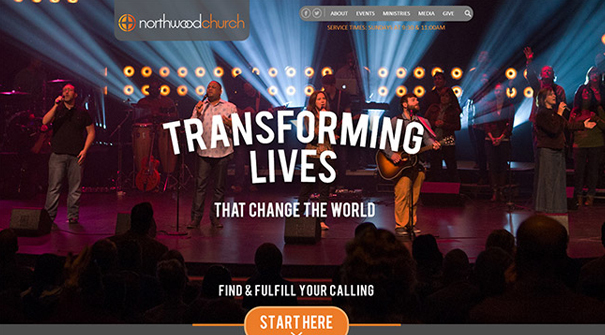 Northwood Church Web Design: Wow! I feel so excited here. Electrifying image gets you thrilled and wanting you to be part of people eager to change their world. 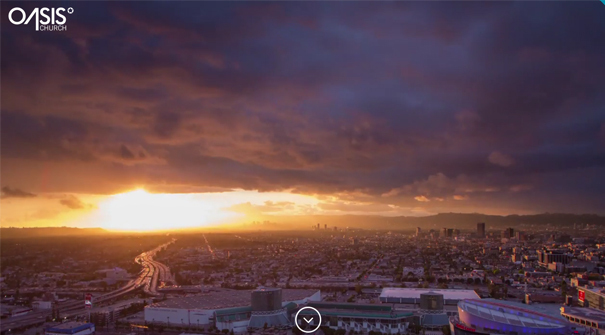 Great use of photography in website design. Nu Church Website Design: Design idea cuts across different units of the church as reflected in the banner section. Don’t ask me what the red big square stands for please. Oasis Church Web Design: Unconventional design forcing you to appreciate the powerful photography it presents. 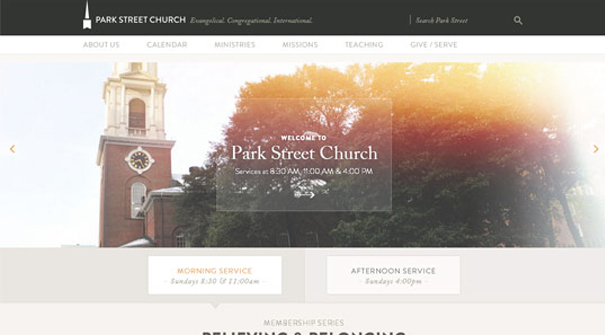 Park Street Church Web Design: Church is surrounded by beautiful scenery and this is simply projected in the design. 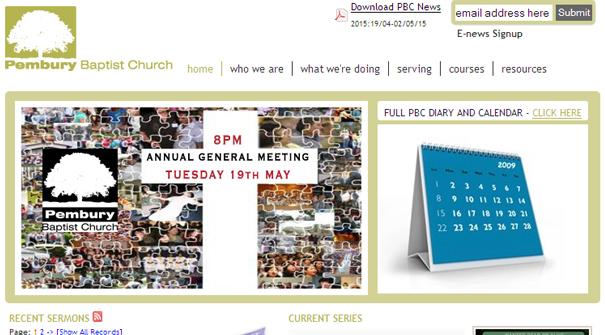 Pembury Baptist Church Web Design: Concept places importance on bookmarking church’s activities for the year on your diary and calendar. Header section will need some tidying up. Phoenix First Church Web Design: Call to action buttons strategically placed to drive you to want to click. Beautiful presentation of graphics. 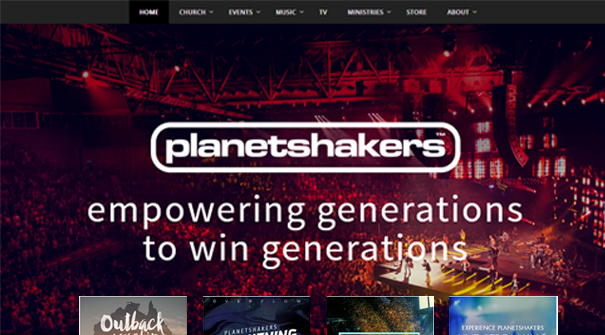 Planetshakers Church Web Design: Interesting lighting effect on full width image used. Design has a very good. clean navigation menu. 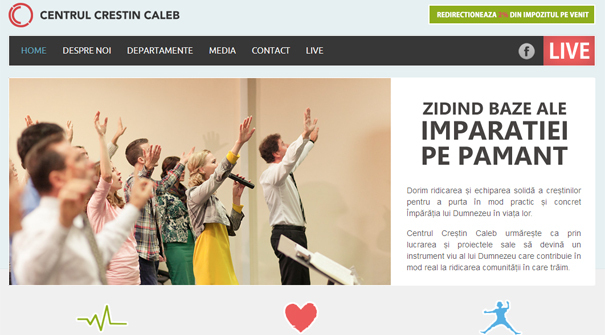 Reading Family Church Web Design: Flat UI contemporary design. Reality Church Web Design: Wherever He is, we excitedly and gladly follow. Cute little OUTSTANDING blue call to action button strategically positioned on the top right on a dark background. Redeemer Church Website Design: Typography used majorly for the graphics on this website. Big bold buttons calls you to take desired action. Redemption Church Web Design: Contemporary, conservative design. Remnant Church Web Design: Suspense sets in as you desire to really know how this blurred, dark background looks…next step? Click to visit. 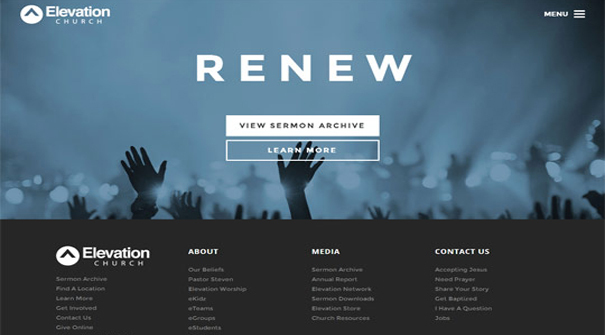 Renewal Church of Chicago Web Design: An unconventional design (check out where logo is placed): A city church right at the heart of the city tells you no matter the hustle and bustle, you can still step in to worship. Risen Church Web Design: A Los Angeles based church in the United States of America is not afraid to tell the world that they are willing not only to serve locally but globally. Full width image usage makes you appreciate the beautifully well lined trees around the city. Risen Life Church Web Design: Beautiful I really got excited with this website design. It looks clean and relaxing (MY WEAKNESS: I love simplicity). Rockcity Church Website Design: Layout well structured and simplified with a toggled menu on the far right. Very clean, very airy, very calm! Rolling Hills Christian Church Web Design: Wholesome use of types in graphic design of the banner section. Saddleback Church Web Design: “Do not conform to the pattern of this world…” Photography literarily illustrates those powerful biblical quotations. 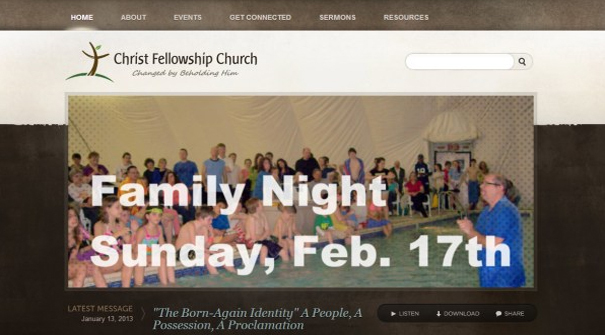 Salisbury Christian Church Web Design: This image slide makes it look kind of like an all children affair. I like the strategic positioning of the logo and navigation. 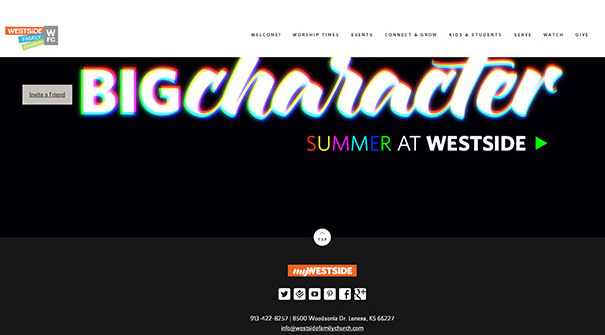 Shadygrove Gateway Church Web Design: Powerful scroll function that reveals cool stuff. 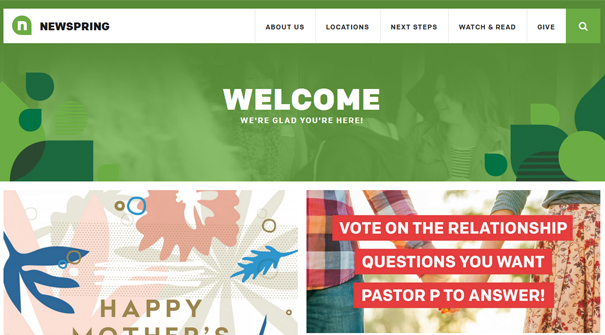 Shoreline Church Web Design: Design looks quite conventional with a contemporary feel, outstanding navigation with additional information on the sidebar. 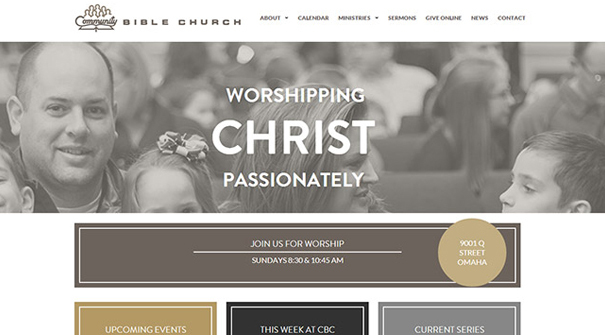 Simply Church Website Design: Flat UI design, no image, no complexities. 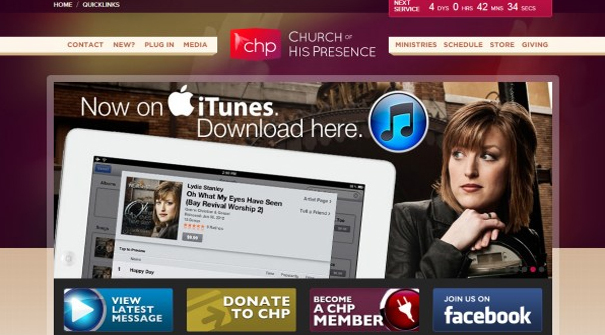 Southland Church Website Design: Design capitalizes on bold use of image that covers banner and header section. 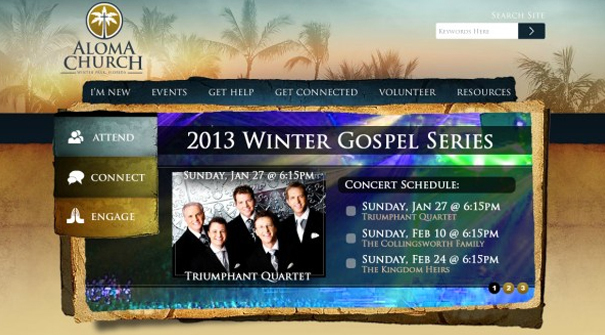 Southwest Church Web Design: Flat UI design with creative use of type for graphics in the header section. 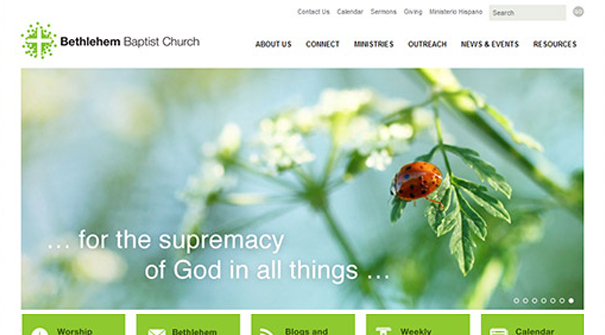 St Andrews Presbyterian Church Web Design: Great use of photography in web design. 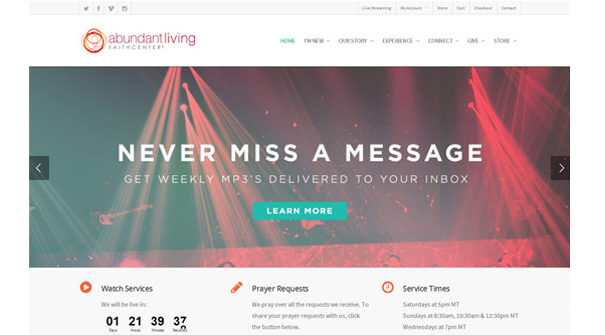 Stonebriar Community Church Web Design: Beautiful header section with an interesting background. St. Patrick Church Web Design: Flat UI design. Dominating blue color is contrasted with orange also used in the buttons to call for your attention. St Richard Catholic Church Website Design: Have a feel of everything in church. Unconventional Design that takes you unaware. T.D. Jakes Ministries Web Design: Design dedicated to promoting gospel products and seeking support for the ministry. 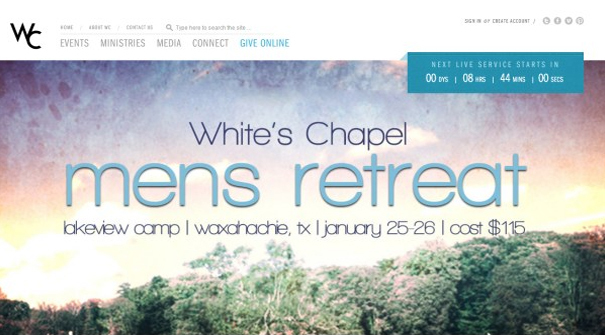 The Chapel Website Design: Powerful use of space and enlarged live video. Toggled navigation keeps design clean, uncluttered and airy. The Church of the Crucifixion Web Design: Powerful and daring use of photography is today’s way to go for great looking website designs. 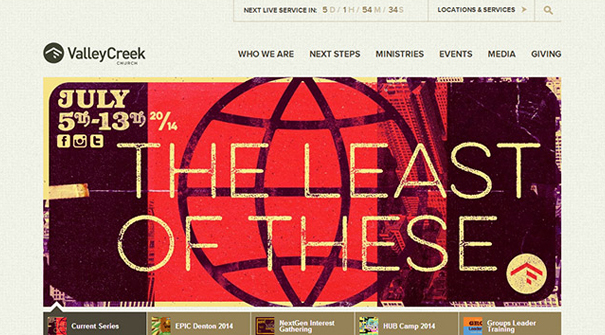 The City Church Web Design: Kids are so happy being in church. Design is clean but I’d prefer the copy section does not cover the smiling lips of the other kid. The Father’s House Web Design: Another example of a simple design welcoming you home(page). The Redeemed Evangelical Mission Web Design: Conventional, traditional design with next church event schedule application running at the top. The Synagogue Church Of All Nations Web Design: Strong, clean hi-res graphics makes website design very rich with bold colors. 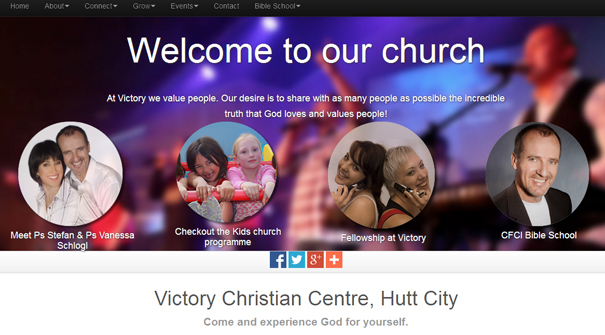 The Village Church Web Design: I love the creative positioning in the header section. The banner section is filled with a live photo of worshippers in church. Social icons projected in clean flat UI design. Impressive! TNL Church Web Design: Quite a lot to contend with here. Let me have your comments. Trinity United Methodist Church Web Design: Church aint that rigid not to allow some form of relaxation. Design calls all to enjoy summer in a relaxed outfit. Triumphant Christian Centre Web Design: Contemporary design projecting a live worship session with the Senior Pastor ministering. 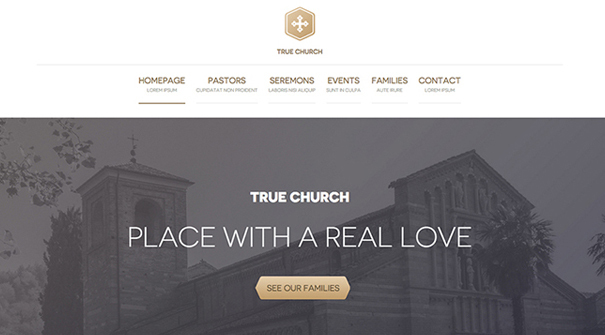 True Church Website Design: Design puts some form of emphasis in the “place” where you find real love. 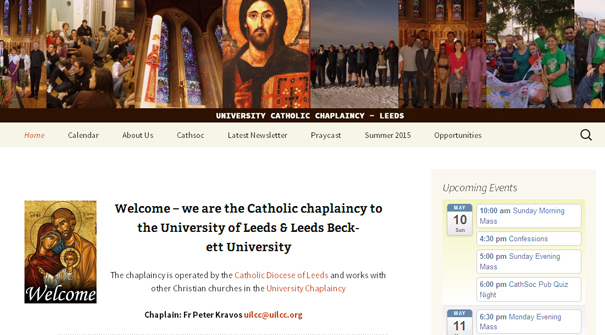 University Catholic Chaplaincy Web Design: Unconventional approach employed here. 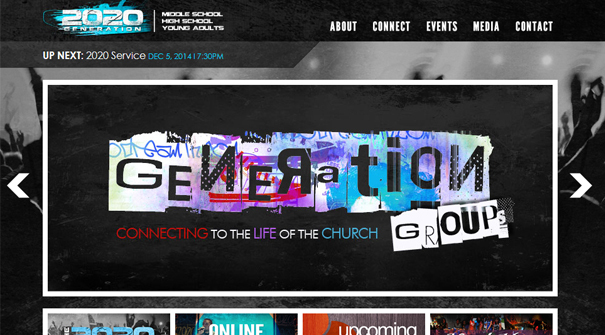 Valley Creek Church Web Design: Creative use of graphics and typography in the banner section of design. Victory Christian Centre Web Design: All-in-one banner image that introduces you to the senior pastors and other fellowships within the church. Victory Worship Centre Web Design: Collapsible image presents an image that also incorporates social icons. Watermark Church Web Design: Impressive layout and background used to present a cool natural website design. 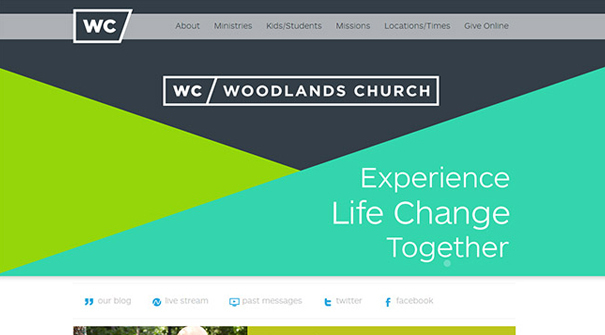 WC Church Website Design: Flat UI design with typography majorly used for graphic design. 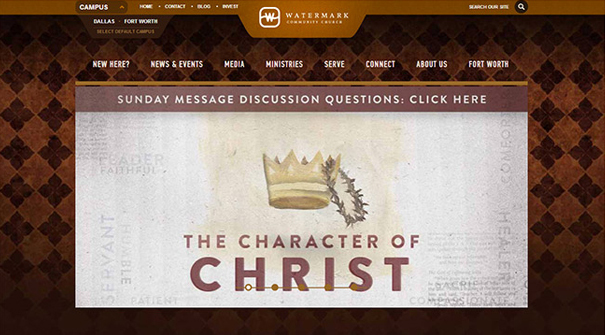 Westwide Family Church Web Design: Typography used for conventional, traditional design. Arrangement of navigation looks clean. 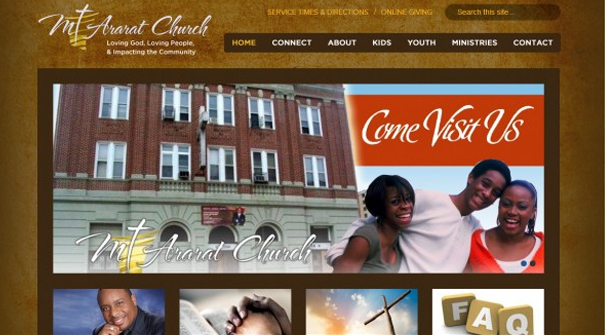 Whites Chapel Web Design: I hope this church is not for whites only because I’m black, lol! Schedule app strategically positioned to tell you how long the next service is from when you land on the page – so prepare, let’s go churching.